undiscovered gems and great adventures await you! Welcome to Cascade Valley Wine Country; Washington’s Peak Wine Experience! Meet the makers, sample new releases and old favorites at one of the regions many wine tasting events; or plan your tasting tour for old favorites and new discoveries! Encompassing the Lake Chelan AVA, established in 2009; our wines are an excellent reflection of the rich, complex textures, minerals, and elegant depth our grapes draw from this unique region. Lake Chelan’s favorable mild temperatures and “Lake effect” result in a longer growing season, allowing the grapes to extract a distinguished character enhanced by glacially carved soils with distinctive properties like coarse sandy sediment, and notable amounts of quartz and mica. This alluring region provides over 30 destination wineries with incredible growing conditions, world-class winemakers, stunning mountain vistas, and the un-paralled beauty of the clear blue waters of Lake Chelan. Wenatchee’s lush fertile valley is bordered by ice age volcanic basalt cliffs and the towering granite peaks of the Cascades that have been long known for providing ideal growing conditions for apples and other tree fruits world-wide. Located in the Columbia Valley AVA and stretching south towards the Wahluke slope, the valley’s combination of warm sunny days, cool nights, rich volcanic soils and abundance of pure mountain water have proven to give our grapes the same optimal conditions, expressing a delightful character resulting in outstanding wines! Emerging as a favorite destination for outdoor and wine enthusiasts alike, the largest city in the region with a small town feel is rich with entertainment, art galleries, boutique shopping, and outdoor recreation. Providing visitors with all the comforts of home, and exciting adventures ready to be discovered just outside the door! Nestled in the foothills of the Cascade’s, the Bavarian style village of Leavenworth transitions in to warm summers and a crisp shoulder season coupled with unique volcanic and granite terrain, producing wines that culminate in a bright, smooth character that is truly a one of a kind treat! Primarily featuring over 30 tasting rooms and wineries, most within walking distance of your hotel, this charming mountain village combines old world charm with the Pacific Northwest hospitality! Attracting innovative and passionate wine makers, the region is an unforgettable experience tempting travelers to taste, sip, savor and enjoy the picturesque scenery, boutique shopping, food and drink culture, world renowned recreation and exciting festivals all year long. From small humble tasting rooms, to lavish breathtaking wineries tucked away in the surrounding canyons, Leavenworth’s wine touring is at its finest, boasting many local outdoor outfitters offering year-round opportunity to pair exciting outdoor activities with captivating wines for the adventurous spirit. In Cascade Valley Wine Country, our doors are open year-round to discover an experience any wine lover with a taste for adventure is sure to adore. 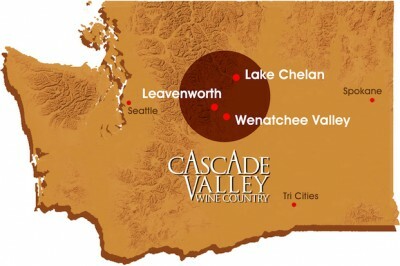 For more visitor information and a calendar of tasting events visit www.cascadevalleywinecountry.com. Connect on Twitter @CVWCWines or Facebook at facebook.com/cvwc.wines. Wine enthusiasts will find our wines to be every bit as spectacular as our region! Our small, innovative wineries are consistently ranked by the likes of Wine Spectator, Wine Enthusiast and other industry experts. They’re the hidden gems of this exciting wine region, just waiting to be discovered by you.